Southern Skywatch September 2009 edition is now up! 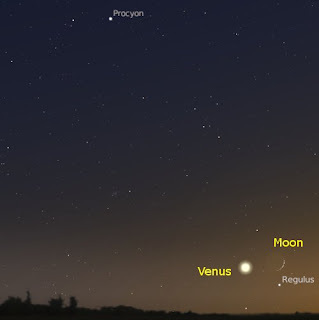 The Moon, Venus and Regulus form a triangle on the morning of September 11. The September edition of Southern Skywatch is now up. There's The Moon forming patterns with Mars and Venus, Venus coming close to Regulus, lots of Jupiter action, the Orionid meteors and an occultation of the Pleiades. To everybody out there searching with the string "double moon" hoping to find out about the Mars event supposedly occurring on August 27, it's a hoax, Mars will not appear as big as the full Moon. But you are picking up some nice shots by correspondent Tony Travaglia. Mike Brown, the discoverer of Pluto-killing Eris, has discovered fog on Titan. This is an amazing discovery as it implies there are large quantities of liquid methane on Titans surface. We have long suspected this (and a lot of the dark patches on Titan are suspected to be methane lakes), but confirmation is pretty stunning. WASP-18b as visualized in Celestia. When first discovered, "Hot Jupiters", giant exoplanets that orbited their stars more closely than Mercury orbits the Sun, were a source of amazement. 373 planets and 149 Hot Jupiters later close orbiting planets are a bit ho-hum. Not so WASP-18b. Discovered by the Wide Angle Search for Planets, this amazing planet screams around its sun, HD 10069, in just under an Earth day. From WASP-18b's surface HD 10069 would occupy 30% of its sky (if you could see the sky from its surface). At over 7 times more dense than Jupiter, it probably has a large rocky core. But it is so massive, and so close to its sun that WASP-18b that it should raise a tidal bulge on its sun, which should slow the planet down and make it spiral into its sun. And there's the rub. WASP-18b should come close enough to HD 10069 to be torn apart in around 650,000 years. The likelihood that we would come across a planet so close to its death dive is quite remote, either we have been extraordinarily lucky in coming across WASP-18b, or there is something wrong with our theories of tidal dissipation in extrasolar systems. Either way, WASP-18b is a planet that will keep astronomers talking for some time. Other discussions of WASP-18b at Sky and Telescope and ScienceNow! If you want to add WASP-18b to Celestia, cut and paste the parameters below to a file and save it as WASP18b.ssc it the extras folder of Celestia, or download WASP18b.ssc to the extras folder. # duration, inclination is 86 degrees, so mass can be determined. # From transit dimming, radius is estimated at 1.11 jupiters. AltSurface "limit of knowledge" "HD 10069/b"
If, like me, your view of the current opposition of Jupiter has been messed up by the appalling weather recently, then hie yourself over to Christopher Go's Jupiter observation page and prepare to be stunned. Especially check out the animation of the Shadow of Io on Ganymede. Do't miss his Saturn page as well. If you are shopping in or around Rundle Mall this coming Friday (28 August, 6:00-9:00pm) the Astronomical Society of South Australia will be setting up telescopes in Rundle Mall.Have a view of the Moon for Science Week while you are out and about! Although Jupiter is past opposition, it is still a fantastic sight in a telescope of almost any size. If the weather is fine, you can view the Moon and Jupiter through the ASSA 0.5 metre telescope and other telescopes and binoculars (if the horrible weather and gale force winds go away) at the ASSA Stockport Observatory. A slide show, sausage sizzle and refreshments will be available throughout the evening. Admission is only $7 for adults and $3 for children. There is no need to book - just turn up on the night at pay at the gate. Details of the Stockport observatory location are here. One of my readers has alerted me to an image traversing the internet that purports to be an image of the alleged doom planet Nibiru. Nibiru is a fantasy, but this object is real enough and quite interesting. 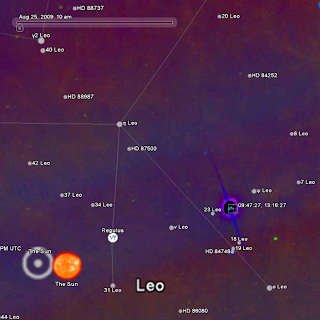 If you have Google Sky (see screen shots above), crank it up, paste the coordinates 09:47:27, 13:16:27 into the location tab and Google sky will take you to an unprepossessing piece of sky near Regulus (image left). Now go to the Observatories check box and turn on the IRAS infra-red overlay and a bright, angry looking object appears (image right: you can also see it in the IR maps in World Wide Telescope). remarkable animation shows the movement of hot gas in the envelope over a period of 3 years. 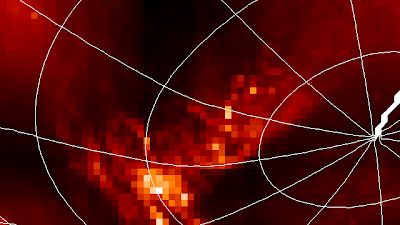 Left image: CW Leo shown in the IRAS 12 µm survey. The second bright star is HD 84748. 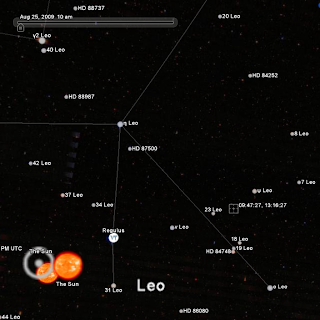 Right image: Skymap screen shot showing CW Leo (PK 221+45 1) between 23 Leo and Phi Leo, as in the Google Sky maps (as always, click to embiggen). The First Quarter Moon is Thursday August 27. Mercury is easily visible in the evening twilight, while Saturn is soon lost in the twilight. Jupiter is visible the whole night and is easily seen as the brightest object in the sky. 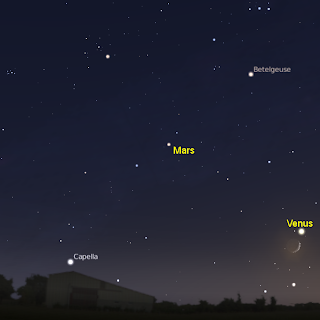 In the morning, Venus and Mars are seen above the eastern horizon before dawn. Mars is close to the open cluster M35 August 28-30. Evening sky looking west at 6:30 pm local time on Friday August 28. Click to embiggen. The First Quarter Moon is Thursday August 27. Mercury is easily visible in the western evening twilight. Mercury rises rapidly in the sky, heading for the bright star Spica (see diagram left). Saturn is visible in the early evening twilight just above above the north-western horizon. During the week it becomes more difficult to see as it lowers into the twilight. Saturn sets before 7:00 pm local time, making telescopic viewing of Saturn extraordinarily difficult. Jupiter is visible the whole night and is easily seen as the brightest object in the sky. While Jupiter is past opposition, where it is biggest and brightest as seen from Earth, it is still more than big enough to be appreciated in even the smallest telescope. If you don't have a telescope to view Jupiter, why not go to one of your local Astronomical Societies or Planetariums open nights? Jupiter's Moons are readily visible in binoculars or a small telescope. On Thursday August 30 Jupiter has an interesting alignment of Moons. 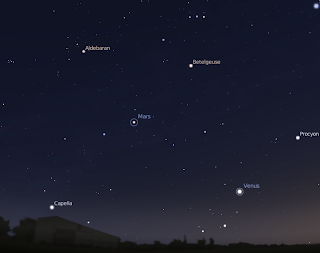 Mars, Venus, Aldebaran and Hyades at 6:00 am local time on Friday morning August 28, click to embiggen. In the morning, Venus and Mars are readily visible in the eastern sky. Red Mars (which will not be as big as the full Moon this week) is below the the constellation of Orion and forms a elongated triangle with two bright red stars Aldebaran and Betelguese in Orion. 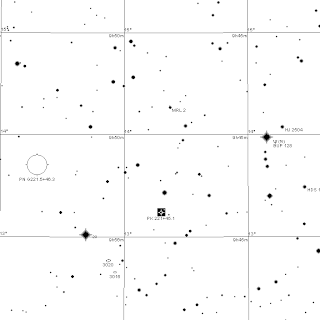 Between August 28-30 Mars is close to the open cluster M35. This meeting is best viewed with binoculars. Bright white Venus is close to the horizon, but is still readily visible in the dawn twilight. On Wednesday September 2 Venus is close to the Beehive cluster in Cancer. This will be difficult to observe, being close to the horizon, but with good binoculars this should be a splendid sight. The Big Aussie Starhunt has been extended to August 30, due to the inclement weather that has plagued us. Just a reminder, The Big Aussie Starhunt is a Australia wide event to get people more familiar with our wonderful night sky, and to raise awareness of light pollution so it's well worth participating. All you have to do is count how many stars you can see in Scorpius using very simple star-charts! Use SkippySky to get cloud cover predictions so you can choose a clear night. As well as the starhunt, there is a wealth of information and resources on our skies and how to observe them. 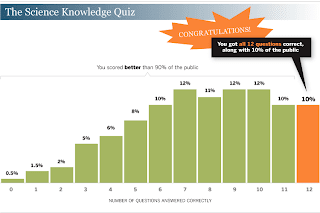 I've just did a depressing test, the Science Knowledge Quiz from the Pew Research Centre. Yes, I got them all right, but they were astoundingly easy. What was depressing was that only 10% of the population (mostly US citizens), could get it right. The questions included such brain teasers as "Electrons are smaller than atoms, true or false". It's enough to make a grown scientist cry. In terms of astronomy, only 60% of people were aware that Pluto had been demoted! Given the huge publicity over the demotion of Pluto, and the fact that the demotion of Pluto has been made an icon of how badly scientists treated the public by springing the demotion on them (not) by Chris Mooney and Sheril Kirshenbaum, the fact that 40% of the American public is unaware that Pluto has been demoted is worrying. You would expect that all the "public protest" that Mooney and Kirshenbaum report would have raised awareness (unless, of course, it was all a beat up, and most of the public didn't actually care). Still, that such a high profile event has by-passed the conciousness of so many people is worrying. Similarly, NASA has a well financed publicity office, with lots of press releases and informative websites (and online TV), yet, yet, only 61% of people were aware of the discovery of water on Mars (whereas if I see another press release saying "more evidence of water on Mars" I'll scream). Heck, only 65% could identify CO2 as a greenhouse gas, with the amount of reportange flying about, how could you miss this? If such high profile, front page media events penetrate to just over half of the public, how is more mundane science going to make an impact? Mooney and Kirshenbaum are big on scientists becoming communicators (something I'm definitely in favour of), but given the failure of high profile, well sported media exposure from these three key events (Pluto, Water on Mars and CO2 in global warming) to penetrate the conciousness of more than 3/4 of the American public, just how are ordinary scientists, with average budgets and far less exciting results going to make an impact at all. If Mooney and Kirshenbaum can answer that, I'll listen intently. Carnival of Space #117 is here. 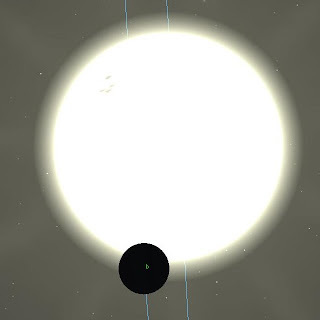 Carnival of Space #117 is now up at Simoastronomy. There's the 50th birthday of the X-15, text messages to aliens, analemmas, moons of an asteroid, space elevatoprs creeping towards reality, defining alien life and much, much more. Head on over for some astronomy goodness. 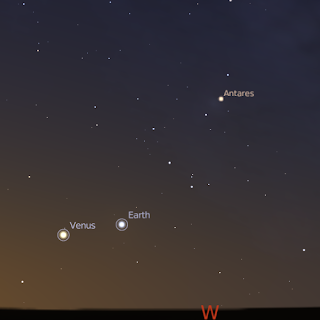 Venus and Earth as seen in the Martian sky on June 29, from a latitude equivalent to Adelaide, as rendered in Stellarium. Sometime back in July the Lounge of the Lab Lemming posted a shot of Earth, Venus and Mercury as seen from the surface of Mars, rendered in Celestia. Celestia has long been the premier program for seeing the Solar system (ours, or any other one that we have discovered) from different points of view. 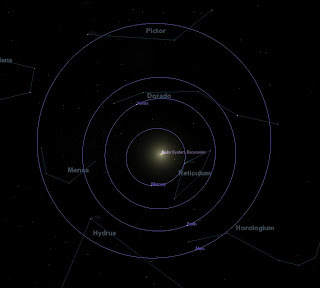 I've done a few conjunctions from the surface of Mars in Celestia myself (see here and here). However, getting to a consistent spot on a planetary surface and looking up with Celestia is a right pain. I have a script that lets me do it which can be modified as need be, but it still requires a bit of mucking around. But now Stellarium 10 comes with the ability to set your observing station on Mars, or any other planet or object that is in the Stellarium planets/asteroids/comets list, even ones you have entered yourself. Just click on the location icon in the lefthand side bar (the one that is annoyingly hidden until you move the mouse over to the left, or press F6 to call up the location dialogue choose Planet (and Mars) then you have to go to the sky and viewing options dialogue (F4), then choose the Landscapes menu and choose Mars (otherwise there are trees incongruously on the surface of Mars) and Robert is your avuncular relative. Celestia will still be the premier visualization program for seeing the sky from asteroids, satelites and exoplanets, but seeing conjunctions from the surface of Mars just got easier. Mercury rises in the evening sky, while Saturn sinks lower towards the horizon (click the image to embiggen). Saturn will be leaving our skies shortly. It's currently ringless form (at least to our view, as the rings are edge on), will disappear into the twilight over the week. But if you are up watching the pair, why not wait a little longer and join in the Big Aussie Starhunt? I'm featured in the Carnival of Elitist Brass-Studs XV over at the Coffee-Stained Writer. Go have a look (or Storm the Beaches, as the COEB say). Carnival of Space #116 is here. Carnival of Space #166 is now in orbit at Habitational Intention. There's the voice of Mission Control, weird exoplanets, fantastic art, a Hubble 3D flythrough, space missions that could have been and much, much more. Set your thrusters for parking orbit and head on over. I've Done My Starhunt, Have You? The Big Aussie Starhunt is well underway! I did my survey tonight, the first chance I've had with the cloud and kids. The Big Aussie Starhunt is a Australia wide event to get people more familiar with our wonderful night sky, and to raise awareness of light pollution so it's well worth participating . All you have to do is count how many stars you can see in Scorpius during Science Week (15 – 23 August 2009). The 23rd is coming up fast, so get out and have a go! Use SkippySky to get cloud cover predictions. The New Moon is Thursday August 20, the First Quarter Moon is Thursday August 27. Mercury is easily visible in the evening twilight, and meets the Moon this week. Jupiter is easily seen as the brightest object above the eastern horizon from around 6 pm local time. 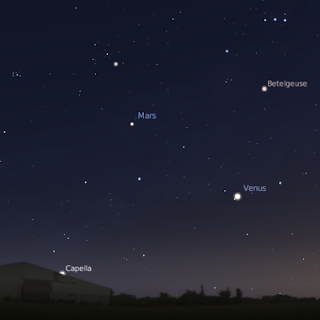 In the morning, Venus and Mars are seen above the eastern horizon before dawn. Evening sky looking west at 6:30 pm local time on August 22. Click to embiggen. The New Moon is Thursday August 20, the First Quarter Moon is Thursday August 27. Mercury is now easily visible in the western evening twilight. Mercury rises rapidly in the sky, meeting the crescent Moon on the 22nd (see diagram left). Saturn is visible in the early evening and is difficult to see just above above the north-western horizon, Mercury is now brighter. Saturn sets before 8:00 pm local time, making telescopic viewing of Saturn difficult. 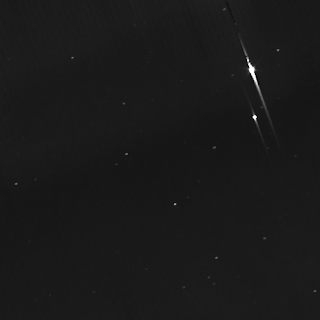 However, Saturn's rings are nearly edge on now, and are currently invisible from Earth, making the effort worthwhile. Jupiter is easily seen as the brightest object above the eastern horizon from around 6 pm local time (and indeed in the sky for the entire evening). Jupiter is past opposition, where it is biggest and brightest as seen from Earth, but is still more than big enough to be appreciated in even the smallest telescope. If you don't have a telescope to view Jupiter, why not go to one of your local Astronomical Societies or Planetariums open nights? Jupiter's Moons are readily visible in binoculars or a small telescope. On Sunday August 23 Jupiter has an interesting alignment of Moons. Mars, Venus, Aldebaran, Pleiades and Hyades at 6:00 am local time on Thursday morning August 20, click to embiggen. In the morning, Venus and Mars are readily visible in the eastern sky. Red Mars (which will not be as big as the full Moon this week) is below the A-shaped Hyades cluster and forms a triangle with two bright red stars Aldebaran and Betelguese in Orion. Bright white Venus is now close to the horizon, but is still readily visible in the dawn twilight. Venus and the crescent Moon shine over the rooftops in the morning. The Red triangle of Mars, Betelgeuse and Aldebaran shines to the right of them (click to embiggen to see the triangle). Close up showing Earthshine and the lunar maria. If you have been watching the western horizon over the past few nights, you will have seen two bright dots gradually coming closer together. These are Mercury and Saturn, pictured here last night. Tonight (Monday) they will be at their closest, so if the weather is right why not pop out and see them. Later, why not participate in the Big Aussie Star Hunt? Saturn is the dot above and Mercury the dot below. It was pretty windy, as the blurred trees in the image attest. Mars, Betelgeuse, Aldebaran and the Moon. Looking north on the morning of August 15 at around 6:00 am (click to embiggen). Looking north in the morning you can see a Red Triangle. This is formed by the Red Giant Betelgeuse in Orion (bright object right side of image), the Red Giant Aldebaran in Taurus (bright object left of centre in image) and Red Mars (bright object towards bottom centre). 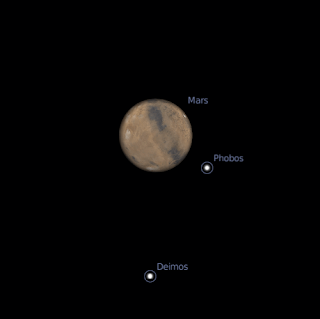 Mars is moving slowly, so the triangle will stay for a while. The Moon will be near Mars tomorrow, then near Venus on Monday Morning. The whole lot looks rather beautiful. 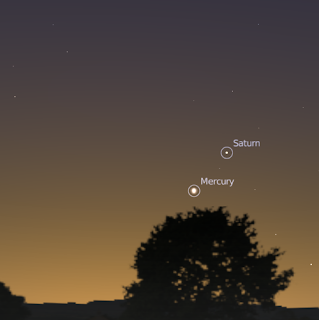 The evening sky facing east on August 17 at 6:30 pm, showing Mercury and Saturn close together. Over the past week Mercury has been catching up with Saturn, and climbing higher in the sky. 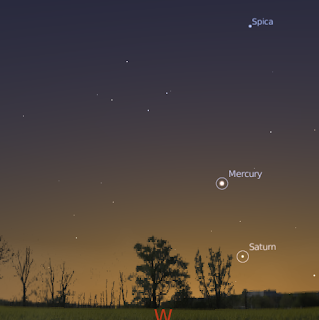 Mercury can be seen clearly now in the western sky an hour after sunset. In a telescope it's a "half moon" shape. Saturn has its rings edge on, but is poorly placed for telescopic viewing. By the 16th Saturn and Mercury will be very close, and they will be closest on the 17th. The Big Aussie Starhunt Starts This Saturday! The Big Aussie Starhunt starts this Saturday (August 15)! The Big Aussie Starhunt is a Australia wide event to get people more familiar with our wonderful night sky, and to raise awareness of light pollution. All you have to do is count how many stars you can see in Scorpius during Science Week (15 – 23 August 2009). There is even a competition you can enter and win. As well, with with Jupiter at opposition it's a great time to do some star gazing anyway (maybe hold an impromptu Star Party). The evening sky looking east at 9:00 pm local time as seen from Australia. Jupiter is at opposition on the night of Saturday, August 15. This is when it is biggest and brightest as seen from Earth. Don't worry, you don't have to dash out on the night of the 15th to see Jupiter wonderfully large, it will be very nice for a few weeks yet. I had a look for the first time through Don the 8" scope tonight (the weather has been very unkind recently), and it looked magnificent. Still if you have a telescope and a free night tomorrow night, it would be a shame not to take a look. If you don't have a telescope but a friend does, inveigle them into giving you a look over the next few weeks (Saturday night is a good night for an impromptu Star Party). If you don't have an astronomer friend, why not go to one of your local Astronomical Societies or Planetariums open nights? If you just have binoculars, Jupiter's Moons are readily visible. Sunday August 16 has an interesting alignment of Moons. Go here for a wonderful overlay image of the eclipse progression at Jinshanwei, China on July 22, 2009. I got out the big scope today, and Saturn was still a lovely ringless ball (even though I had to go to some difficulty to get the scope in a place where I could see Saturn). However, the batteries to the drive were dead, so like before, where I couldn't get any pictures with the 4", I couldn't get any pictures with the 8". Here's two articles on the disappearance of Saturn's rings at Saturnian equinox by the Bad Astronomer and the Universe Today. The Perseids seem to have peaked at 160 meteors an hour at around 08:12 UT (that's 18:13, or 6:13 pm AEST) well before the radiant rose in Australia. Europe appears to be clouded out. SpaceWeather has a photogallery of the Perseids. If you are lucky enough that Saturn isn't behind a tree or hill when the sky is dark, and can train a telescope on it, you will see something amazing. Saturn's rings have vanished! I was pretty amazed when I saw it in my scope, a fat yellow ball absolutely devoid of the rings I had seen my entire astronomical life. Sorry, no pictures, I had to use the unguided 4" scope to get far down enough to the horizon to pick Saturn up, so none of my cameras/webcam arrangements would work. Why have Saturn's rings vanished? Saturnian Equniox, which happens twice in 29 years. For more details see Emily's post at the Planetrary society, and this post at Science Daily. National Science Week Launch Tonight! National Science Week (and the Big Aussie Star Hunt), officially begins on Saturday August 15. However, the SA Science Week Launch is today. A special breakfast launch where winners will be announced for 3 awards: the Unsung Hero of SA Science, the Unsung Hero of Science Communication and the Australian Institute of Physics Excellence in Physics Teaching Award. Unfortunately the launch is invitation only, but this marks the start of over a week of cool science stuff happening all over. Carnival of Space #115 is here. Carnival of Space #115 is now up at New Frontier News. There's the first results from the Kepler Space Telescope (Exoplanets! Oh My! ), the non-showdown at the Pluto corral, plot holes in Star Trek, the non-disaster of 2012 and much, much more. Saddle up and head on over to the New Frontier. The Last Quarter Moon is Friday August 14, the New Moon is Thursday August 20. 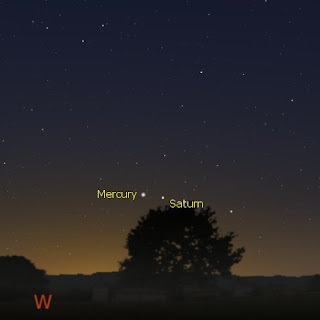 Mercury is easily visible in the evening twilight, and meets Saturn this week. 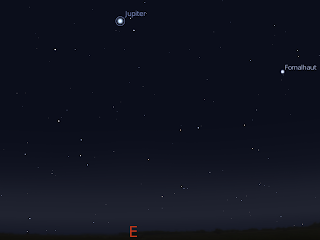 Jupiter is easily seen as the brightest object above the eastern horizon from around 6 pm local time. Jupiter is at its biggest and brightest this week. In the morning, Venus and Mars are joined by the crescent Moon later in the week. Perseid Meteor Shower peaks August 12-13. Evening sky looking west at 6:30 pm local time on August 17. Click to embiggen. The Last Quarter Moon is Friday August 14, the New Moon is Thursday August 20. Mercury is now easily visible in the western evening twilight. 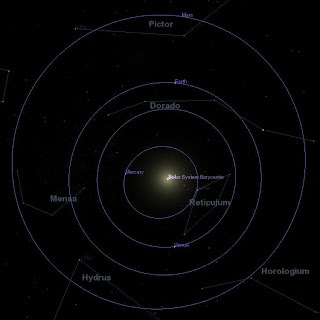 Mercury rises rapidly in the sky, meeting Saturn on the 17th (see diagram left). Saturn is visible in the early evening and can be easily seen as the third brightest object above the north-western horizon, Mercury is now brighter. Saturn sets around 8:00 pm local time, making telescopic viewing of Saturn difficult. Saturns rings are nearly edge on now. Jupiter is easily seen as the brightest object above the eastern horizon from around 6 pm local time. Jupiter will be at opposition, where it is biggest and brightest as seen from Earth, this week, on Saturday August 15. If you don't have a telescope to view Jupiter, why not go to one of your local Astronomical Societies or Planetariums open nights? Jupiter's Moons are readily visible in binoculars or a small telescope. On Sunday August 16 has an interesting alignment of Moons. 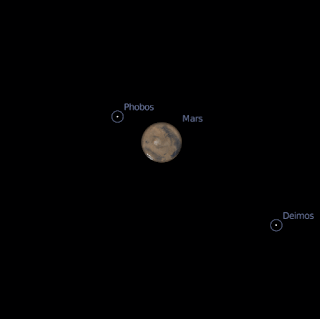 Mars, Venus, Moon, Aldebaran, Pleiades and Hyades at 6:00 am local time on Tuesday morning August 18, click to embiggen. In the morning, Venus and Mars are readily visible in the eastern sky. Red Mars (which will not be as big as the full Moon this month) is below the A-shaped Hyades cluster and forms a triangle with two bright red stars Aldebaran and Betelguese in Orion. Bright white Venus is coming closer to the horizon, but is still readily visible. Between Sunday 16t August and Tuesday 18 August the crescent Moon lines up with Mars and Venus. Printable PDF maps of the Eastern sky at 10 pm, Western sky at 10 pm. For further details and more information on what's up in the sky, see Southern Skywatch. 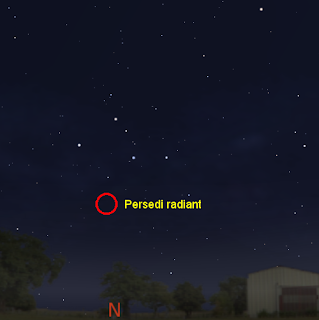 The Perseid Meteor Shower peaks on the morning of Thursday August 13. Despite this being a quite reasonable meteor shower, and probably in outburst this year, for most of Australia, the radiant is below the horizon, and only the very occasional meteor shooting up from the northern horizon will be seen. (UPDATE: to make this a bit clearer, anyone south of Brisbane will see only the occasional meteor, say maybe one or two per hour, the further north of Brisbane you are, the more meteors you will see). 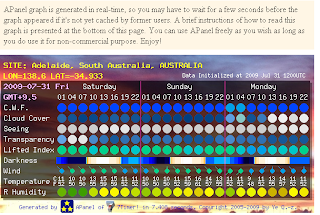 You can check predictions for your local area at the NASA meteor flux estimator (choose 7 Perseids and 12-13 August 2009). People around Alice Springs and Darwin have the best chance of seeing meteors, possibly as many as one every 3 minutes, although the waning Moon's light may interfere. To see the meteors, you will need to be up around 3:00 am local time on the 13th, with best views 4:00 am-5:30 am. The meteor shower will be located due North, with the radiant just above the northern horizon. You can follow the Perseids at the International Meteor Organisations live website. I was at Science Alive!, South Australia's Science Expo today, both as an observer and as an helper at the University of Adelaide stand. Now, my observations are relevant to the current debates on "Unscientific America" and Dr. Dembski's science envy. It was a wet , horrible day and Science Alive! was packed. There were line-ups to the slugs-n-bugs, make your own LED torch, the planetarium, the live science show and the science magic shows. 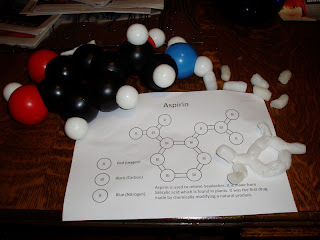 The Universities stand was deluged, we were making slime, getting kids to extract DNA from strawberries, doing colour change tricks with pH sensitive dyes and CO2 pellets, getting kids to make models of what's in their bodies and my bit, making molecular models using peanut starch packing beads. People had been working on the stand since the doors opened at 10:00 am and had not stopped talking. They ran out of slime! Overall it was estimated that over 20,000 people came today, on a day most people would want to stay inside. Somewhere in the vicinity of 40,000 people visited over the weekend, out of a city of just over a million people, that means 4% of the population took time off to come to a science expo! People (at least in Australia) are interested in science. I had an interesting discussion with someone on exoplanets, I heard someone say they came to Science Alive! with their kids every year. It's the sort of thing that is Dr. Dembski's nightmare, people interested in and engaged with science. It's what Chris Mooney and Sheril Kirshenbaum want, scientists passionate about their work meeting and engaging with people. And yet, and yet ... Australia does as bad as everyone else when it comes to science literacy. In terms of global warming Australians are just as misinformed as the rest of the world, as evidenced by the letters pages in our major newspapers and online science forums. Despite our interest in and engagement with science at live events, science in the pub (an such like), newspapers and radio and TV and online science shows, we do badly at the things that matter. Since we are doing everything Chris Mooney and Sheril Kirshenbaum want (and our Universities have special science and media training for academics, I've done the course), but our science literacy hasn't risen, what is the way forward? This is an image of Scorpius taken with my digital Canon IXUS back in mid-July. You will need to click on the image to embiggen it. a 10 second exposure with ISO 400, the camera had to be balanced on the roof of the car to take this shot (no tripod available). In the original, you can see nice detail in the triffid and lagoon nebula areas. Left image, telescopic view of Mars as seen from Earth during the August 2003 opposition, Right Image, Mars at the same scale as will be seen at the next opposition on 30 January 2010. Once again, as it has every two years since 2003 during the Great Opposition of Mars, the Mars Hoax is back. People are receiving very long and graphic heavy emails claiming Mars will look as big as the Full Moon in August, the time of the 2003 opposition. Even in 2003, Mars would not have looked as big as the full Moon. Mars was 25 arc seconds across, hardly the diameter of the full Moon even through a modest telescope. The Moon is 0.5 degrees across, about half a fingerwidth, Mars was less than 1/60 of that. The human eye can only see things larger than 1.2 minutes of arc as anything other than a point, and Mars was a 1/3 of this limit in size. The images above would only be seen through powerful telescopes. This set of images taken with my Webcam gives a better idea of what someone would have seen with a modest telescope. Mars is not even at opposition this year, it will be at opposition on 30 January 2010, with a rather ordinary apparent diameter of 14 arc seconds (see righthand image above). This will be a visible disk in even small telescopes, but you will need a modest diameter scope to see reasonable detail. Mars will be smaller still at the 2012 opposition but starts increasing in size again after this and will be at a similar size to 2003 at its July 2018 opposition (24 arc minutes across). Yes, it's disappointing that Mars won't be big, but let's use this as a learning moment. Why does Mars's apparent size at opposition keep changing? Left panel, Mars and Earth at the time of the great opposition in 2003. Right Panel, Earth and Mars at the 2010 opposition (click images to embiggen). Note earth and Mars are much closer in 2003. If you have Celestia, you can model the oppositions and see for yourself. If the Earth's and Mars's orbits were circular, Mars and Earth would stay a constant distance from each other. But they aren't, they are elliptical. So Earth and Mars draw away from each other and pull close to each other regularly. Earth and Mars are closest when Mars is at it's closest approach to the Sun (perihelion) and Earth is at its furthest (aphelion). Now, if Mars's orbit was an integer multiple of Earth's year, then Earth and Mars would be closest at the same time each year. But they aren't. Mars's year is roughly 1.9 times longer than that of Earth, so the time of Mars's closest approach to the Sun drifts with respect to Earth's furthest distance from the Sun. Earth's Aphelion and Mars's Perihelion align roughly every 15 years. But again, because the years are weird fractions of each other (as well as other orbital jiggery pokery), some alinements are better than others. August 2003 was the best for approach for thousands of years, but the 2050 opposition will only be a smidgen smaller. Mars may not be as big as the Full Moon at the moment, but it is in some beautiful territory at the moment. As Mars grows brighter and brighter, and comes close to the Beehive cluster, it will be a magnificent sight. In the run-up to National Science Week, Science Alive!, South Australia's Science Expo, will be held in at the Wayville Pavillion in the Adelaide Showgrounds. Science Alive! is free, and suitable for all ages. There will be a range of hands on science exhibits, science shows, Planetariums, bugs n slugs and you can make your own LED torch and much more. Why not go along and be involved in some great science. The South Australian Neuroscience Institute (of which I am a member) will have a booth there. Maybe I'll see you. Go see this animation, taken at a Texas star party, which is a time-lapse animation of the rise of the core of the Milky Way, with meteors occasionally shooting through. It's brilliant! The full Moon is Thursday August 6. 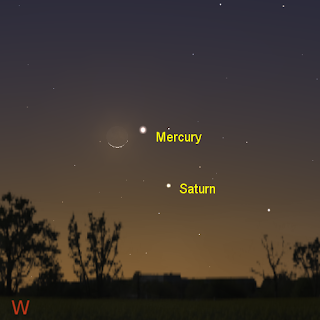 Mercury is now visible in the evening twilight, heading for Saturn. Saturn is visible in the early evening above the north-western horizon. 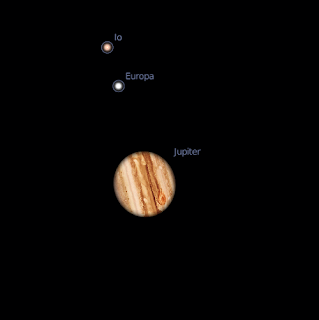 Jupiter is easily seen as the brightest object above the eastern horizon from around 8 pm local time. In the morning, Venus and Mars are readily visible in the eastern sky. Perseid Meteor Shower peaks August 12-13. Evening sky looking west at 6:15 pm local time on August 13. Click to embiggen. The Full Moon is Thursday August 6. Mercury is now visible in the western evening twilight. 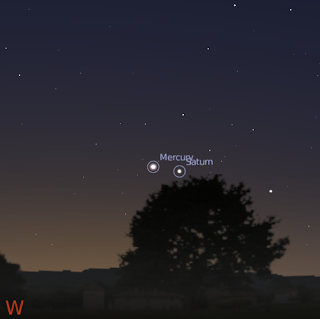 Mercury rises rapidly in the sky, closing in on Saturn (see diagram left). Jupiter is easily seen as the brightest object above the eastern horizon from around 8 pm local time. Jupiter will be at opposition, where it is biggest and brightest as seen from Earth, next week. Jupiter's Moons are readily visible in binoculars or a small telescope. On Thursday August 6 the Moon is near Jupiter. Friday August 7 has an interesting alignment of Moons. 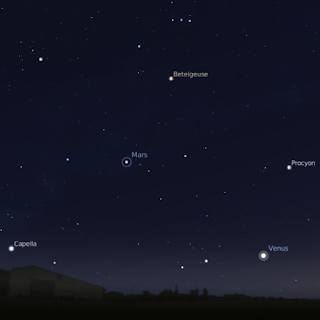 Mars, Venus, Aldebaran, Pleiades and Hyades at 6:00 am local time on Friday morning August 7, click to embiggen. In the morning, Venus and Mars are readily visible in the eastern sky. Red Mars is below the A-shaped Hyades cluster, which forms the head of Taurus the Bull (see image above) . Bright white Venus is well below Aldebaran, and forms a triangle with Aldebaran and red Betelguese in Orion. You can check predictions for your local area at the NASA meteor flux estimator (choose 7 Perseids and 12-13 August 2009). People around Alice Springs and Darwin have the best chance of seeing meteors, although the waning Moon's light may interfere. To see the meteors, you will need to be up around 3:00 am local time on the 13th, with best views 4:00 am-5:30 am. The meteor shower will be located due North, with the radiant just above the northern horizon. The Big Aussie Starhunt is Coming! The Big Aussie Starhunt is a Australia wide event to get people more familiar with our wonderful night sky, and to raise awareness of light pollution. All you have to do is count how many stars you can see in Scorpius during Science Week (15 – 23 August 2009). There is even a competition you can enter and win. As well as the starhunt, there is a wealth of information on our skies and how to observe them. My weekly sky update is even there. Carnival of Space #114 is here. Carnival of Space #114 is now up at Cheap Astronomy. There's community outreach, the real disater in 2012, bubbling Red Giants, 10 years of Chandra and much, much more. Grab your dilly bag and head on over. I'm not very good at following my blog stats, I missed my 5 year bloggaversary in June. True, I was pretty rubbish at updating and stuff, and really didn't get a solid presence until late 2005, but June 2004 was my start in the blogging medium. I passed 250,000 page views back a month or so ago. I was planning on doing something special then, but then I had to do grant responses, finalize the new course I'm making and prepare for exams. So 250,000 passed by. Maybe I can do something at 300,000. 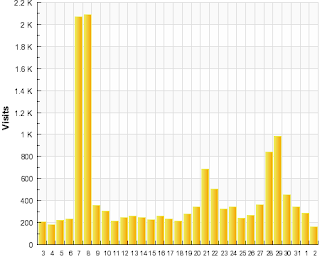 I finally got around to having a look at my recent traffic stats, and had a bit of a surprise. The peak at the 20-23 represents my critique of "Unscientific American", most people came for Pluto though, rather than science communication. On the 27-28th I wrote a critique of Bill Dembski's Science Envy, but most people were visiting to learn about the Mars Hoax. And on the 7th and 8th, where visits soar to an astronomical hight? I have no idea what that is about. No interesting posts and of course I wasn't paying attention at the time. Still, it's an interesting exercise in seeing what I think is important, and what other people think is important. Clouds are a big problem for astronomers, amateur and otherwise. Like last night for instance, where the occultation of Sigma Scorpii was clouded out. Many questions arise. Do I set my alarm clock for some wee hour, if the likelihood of just seeing cloud is high. Should I travel great gobs of kilometres away to have a chance to see a rare event that might be clouded out where I currently am. You could use the satellite photos and forecasts from the Australian Bureau of Meteorology, (or your local equivalent) but the satellite images stop before night time and the BOM predicts rain, not cloud. Both these cloud cover forecasting sites are based on the American NCEP GFS computer weather model data, so be aware of their limitations. To quote Andrew Cool, co-author of skippy Sky. "The GFS model has a resolution of 0.5 degrees, that is only 4 data points per square degree [area of about 30kmx30km], so one should always thinks of *trends* in the forecast rather than exactly what will happen over the clothesline in your backyard." I've used both for a while , and found them sufficiently accurate for my purposes (eg, do I get up at an awful hour of the morning ). 7Timer has the advantage of covering just about everywhere, but uses a fairly cryptic format for specifying sky transparency. I tend only to look at the cloud cover icons, because I can understand those. 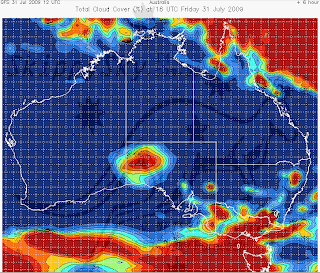 SkippySky is limited to Australia, but has the great advantage of presenting data in a weather map format. This makes the question "Do I drive 200 Km to Didjabringabeeralong to observe the Leonids/Comet/Occultation" much easier to answer. Again, remember that these are models of modest resolution, and the weather has a habit of doing what it blasted well pleases. If you bear that in mind, these programs will make dealing with cloud a whole lot easier. This is the fourth of a planned series of posts on looking at the sky and how to find your way around it as a beginner.